When people ask me when I started Theresa’s Reviews, it began at such a busy time in my life that it can be difficult to think through all of those memories. Recently when I took a red eye flight home from Los Angeles, it really struck me why I started this blog, and I realized that I was ready to share my story. In 2009 my husband and I finished making a short film that he directed in film school. I had acted in it, associate produced it, and dedicated many evenings to helping plan the shoot date, location, food, costumes, and more. The movie had been about superficiality, and I think that’s how I felt the entertainment industry had to started to seem to me. After a gap year of working in Los Angeles, New York, and Nashville on numerous student films, television sets, and movie sets, I was tired. With so much good in the world, I was chasing a dream for the wrong reason. It didn’t feel meaningful anymore. When we finished shooting the film, we became busy really fast with life. We didn’t have plans for the film at that point. He submitted it to be considered for one award, and we didn’t think much about it again. Later that year, when we heard that the movie won the Accolade Award, again, we didn’t come up with plans for what was next with the movie. Life was pulling us in another direction. Months passed. I finished a history degree, wrote part time to pay bills, and then applied to graduate school. Even while working on my graduate degree, I found myself feeling compelled not to give up that dream of being involved with moviemaking. I started submitting the movie to more award competitions. This was two years after we had released the movie, but I realized it still existed. The movie hadn’t disappeared just because we had gotten busy. When more awards started coming in, I began to reach out to bloggers. They generously took their time to write reviews, and I was proud to be the one getting those reviews. My favorite accomplishment was getting a 4-star review from Film Threat because it was something I could put on the poster. Then the poster could go in an Electronic Press Kit, and I could share that press kit with more people, and secure more publicity. Each review led to something new, and that helped our movie become more well regarded in the film community. The help those reviewers gave to our movie was spectacular for marketing purposes. It even helped us secure distribution. It’s always going to be a fun memory when we received our first residual check. It wasn’t enough to pay off the bill we had for renting the Red One 4K for the shoot, or even enough to buy a specialty coffee, but it was unforgettable. Those reviews also gave me hope that I could pursue a dream and that doing what I loved could be possible. I had always felt like moviemaking was what I was meant to do. I had just lost hope in that. When we had no more exciting, relevant news to share about our movie, I was disappointed. After securing a few more interviews about the movie, I began writing for Student Filmmakers Magazine and Daily Actor. I decided to help other movies the way that others had helped ours. By then, I had a graduate degree, but I had some spare time. I took on some PR and publicity work for two independent movies, doing crowd funding campaigns and press releases. I realized that having a review blog would let me help others continue their dream the way someone had once helped my husband and I with our movie. Since that time, I’ve reviewed products from numerous start-ups and helped local businesses, while also getting to share my family story and make something much like a scrapbook to remember our daily moments we have together. Life is busy. With two children, pursuing a dream often goes to sidelines. It’s much easier to think about giving them a chance to live their dreams than it is to think about my own. I’ve thought about whether I would want to stop helping others in their dreams of becoming entrepreneurs and small business owners and instead start to truly live the dream I once had. Maybe that’s something I have to do some soul searching about in the near future. 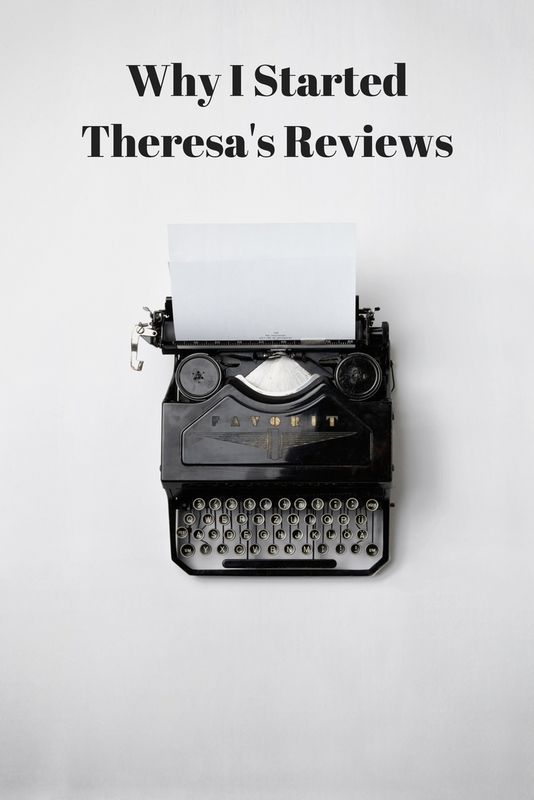 So that’s the story of Theresa’s Reviews and why I started a review blog. It started in part out of a dream that I had put to the side. It also started with the hope of helping others succeed. In the back of my mind, I might have always hoped that Theresa’s Reviews would lead to more creative possibilities. That’s one reason I’m excited to start a new endeavor with The Sammie and Georgie Show. It has so much potential. We’re starting out with toy reviews because that’s what I have connections with, but the goal is to have it be more of a variety show. Hopefully it will give us the chance to inspire others and make them happy while also making us feel fulfilled, because that’s a valuable thing in life. For more, follow Theresa’s Reviews on Facebook, Twitter, Instagram, Pinterest, and Youtube. Thanks for sharing your story! So inspiring! Good to know! I loved reading this!